Silicone Tubing AdvantaSil® Ultra Low Temperature Silicone Tubing is designed to aid pharmaceutical and biopharm manufacturers with protecting their high-value cell and drug products. The platinum-cured tubing is engineered for Single-Use applications involving cold storage and transport. It’s the first commercially-available tubing engineered for flexibility and crush resistance upon removal from a minus 86 degrees C freezer. 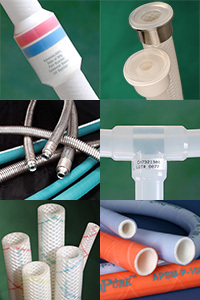 and Process Hoses We specialize in producing platinum-cured silicone hose, platinum-cured silicone tubing & pump tubing, wire reinforced silicone hose, biopharm TPE tubing, rubber covered FEP hose, stainless steel overbraided PTFE hose, wire reinforced EPDM hose, complete sanitary hose assemblies. Sanitary Fittings AdvantaPure has employed the help of a premier fittings expert to bring you a line of crimp fittings that will exceed expectations. With details like sanitary fittings with a 15 Ra or better finish for smooth, non-contaminating flows; 8-sided designs for easier tightening in highly restrictive installations; and radiused edges, AdvantaPure's line of fittings is quite unique. And, since they're specially designed to mate with the NewAge Industries AdvantaPure line of hoses, they offer exceptional performance in most any application. Single-Use Solutions Eliminate production stoppages for sterilization, reduce the risk of contamination, and increase efficiency by incorporating single use systems from AdvantaPure. Single use systems, or SUS, simplify cleaning validations—use once and discard. 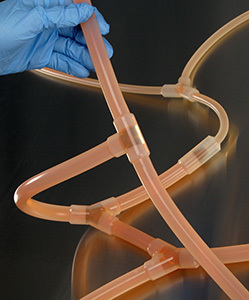 Each system is custom made using platinum-cured, Class VI silicone tubing and hose or Class VI biopharmaceutical grade TPE tubing for peristaltic pump applications. 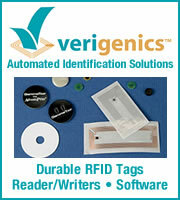 Add fittings, stoppers and container closures, filters, bottles, labels and tracking options, and other components. Molded Products Part of our high purity manufacturing suite, AdvantaPure's Mold Shop utilizes a Class 7 (Class 10,000) ISO-certified clean room to produce a variety of molded components suitable for any number of applications. 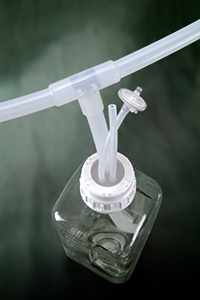 From our BioClosure® Container Closures to molded connectors and manifolds, molded products in either platinum-cured silicone or biopharmaceutical grade TPE can be custom made to meet your application’s specific requirements. Focusing on pharmaceutical, biopharmaceutical, and other high purity industries allows AdvantaPure to address the challenging and ever-changing requirements of those markets. 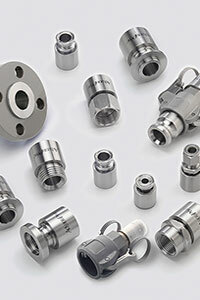 We're able to manufacture and supply sanitary tubing, hose, fittings, and single use process components that meet and exceed the specific performance requirements they demand. Emphasis is placed on quality, cleanliness, validations, reliable delivery of product, and – of course – you, the customer. 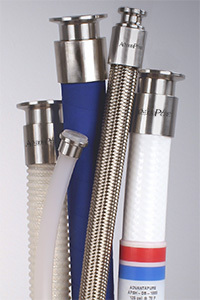 With the justifiable concern over the safety of products that come into contact with pharmaceutical, food, beverage, and chemical ingredients, AdvantaPure is pleased to offer several of its products — silicone tubing, reinforced silicone hose, molded silicone components, and pharmaceutical-grade TPE tubing — certified to be free of animal-derived ingredients. to discuss your applications at 1-888-755-4370. Offering superior material penetration, gamma irradiation is chemical free, residual free and post-process radiation free. The irradiation process destroys microorganisms and bacteria and is the sterilization method of choice for many finished products used throughout the pharmaceutical and medical industries. Have your products gamma irradiated before they arrive at your location and save the additional inventorying, transportation costs, and transit time. 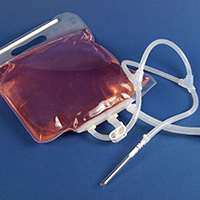 A number of AdvantaPure's silicone and AdvantaFlex products, particularly those designed for single use, are available with validated sterility assurance of 10-6 per ISO 11137 method VDmax. 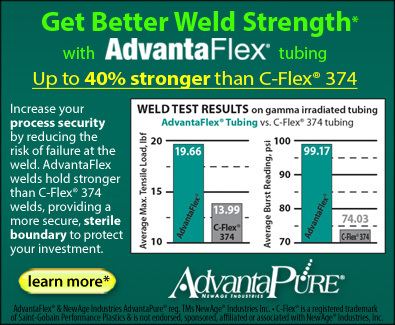 Contact your AdvantaPure representative today for more info at 1-888-755-4370. 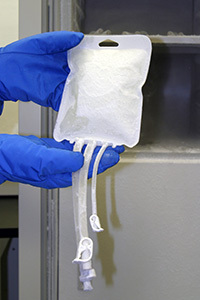 Sterile molded filling assemblies from AdvantaPure continue the shift to Single-Use processes that save time and reduce the risk of cross contamination while increasing productivity between batches. Assemblies can be quickly installed and operational in a fraction of time as compared to traditional systems used in pharmaceutical and biotech filling. 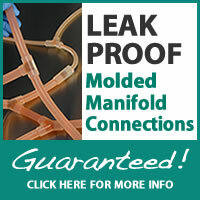 The multiport Tri-Clamp® design reduces potential leak points, minimizes holdup volume and provides seamless flow. AdvantaPure is the high purity products division of NewAge® Industries. In business since 1954, we manufacture and stock large quantities of a wide variety of tubing and hose for same day shipment. Visit the NewAge Industries website for more info.